Upma recipe – Upma is one of the favorite breakfasts in our home . Breakfasts are very important meal to start our day, which provides energy through out the day. 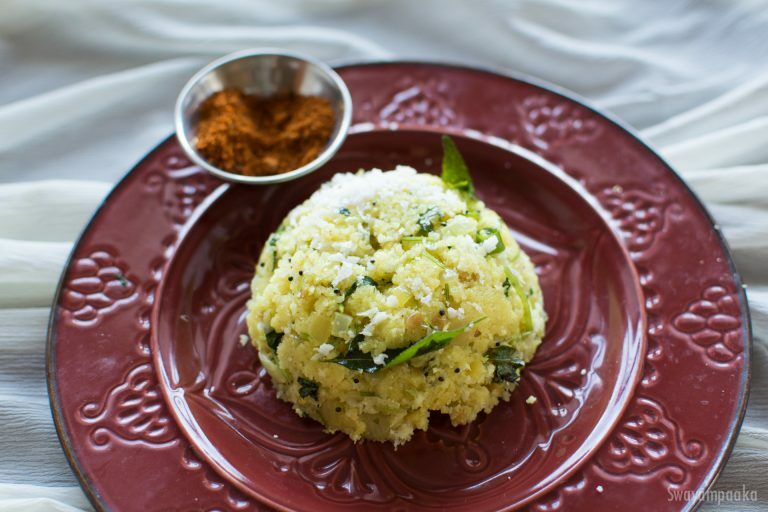 Among our many healthy breakfast foods upma/uppittu is one of the easiest, tastiest and healthiest ones. We can prepare plain and simple upma with roasted rava , seasoning and water, or adding many vegetables and making varieties of upma/uppittu. The popular breakfast combination you see in the Karnataka restaurant menu is Uppittu and kesari bath aka chow chow bath. It is served on the plantain leaf with some ghee..yum. Dry roast the rava until the raw smell disappears or turns light brown color. Keep the water to boil. Heat 3 TBSP oil in a pan on medium heat. Once the oil is hot enough add mustard seeds, once the mustard seeds pops add chana dal and urad dal. Fry it until the dals turn golden brown. Then add the green chillies. Fry it until it turns little white. Now add the chopped onion, curry leaves and turmeric powder. Mix well and fry it for 1 to 2 minutes. Now add the boiling water. Add coconut,(if you are using the frozen coconut) and salt. Reduce the heat and slowly add the rava, mixing it along. Cover it and let it cook on low heat for 5 minutes. After 5 minutes turn off the heat.Reduce the heat and slowly add the rava, mixing it along. Cover it and let it cook on low heat for 5 minutes. After 5 minutes turn off the heat. Add grated fresh coconut, mix it and garnish with cilantro.